Sanitize an entire room in just minutes! Gets rid of disease-causing microbes almost instantly. Perfect for dorm rooms, hotels, nursing homes, offices, hospitals, classrooms and more. Great for cold and flu season! Comes in a 3 oz. can; 12 cans per case. 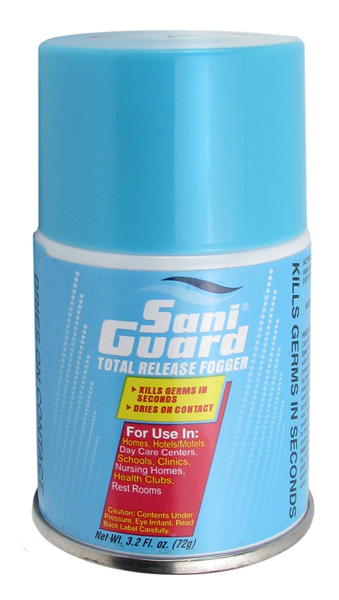 Saniguard Sanitizing Fogger kills germs and dries on contact. It does not leave any slippery residue on surfaces it comes into contact with. General Sanitizing Directions: Use Sani Guard Fogger to sanitize pre-cleaned non-porous environmental surfaces. Approved for food contact surfaces, no potable rinse required. Adequately clean all surfaces before sanitizing. Fogger Directions: Close all outside windows and doors. Use one (1) container for each 125 sq. ft. (12’ x 12’ with 8’ ceiling). Elevate fogger by placing on a stand or table if possible (maximum 2’ off ground). Tilt away from face before activating (container sprays straight up). Press down firmly on the edge of the actuator tab until it locks into place, then set fogger on floor, stand or table. Leave the area immediately after activating fogger. Keep treated area closed for at least 15-20 minutes before returning.